As I update my computers through new releases of Linux distros, since no distro includes all the applications that I use (applications that I find the most bug-free and reliable and feature-appropriate), I find that I need a checklist to make sure that I can quickly download the missing applications in a minimum amount of time, from 'repositories'. I will probably make the latter page my 'master list'. But for now (mid-2011), the first three are probably more up-to-date. I am maintaining these lists of applications that are of use to me --- to facilitate making a distro-on-a-USB-flash-drive --- or to facilitate making an apps-install script (examples below). Or, at least, to have a checklist by which to manually install the apps on a new Linux install. Ubuntu 9.04 (2001 October release) was my favorite distro, in 2009 and 2010. I find that I would like to put it, with my added apps, onto several other PCs. So I MAY want to be able to automate the process of creating a 'customized' Linux USB flash drive, so that I can quickly make my own 'master image' and then relatively quickly install the 'image' on other PCs --- PCs of mine or of friends and relatives. 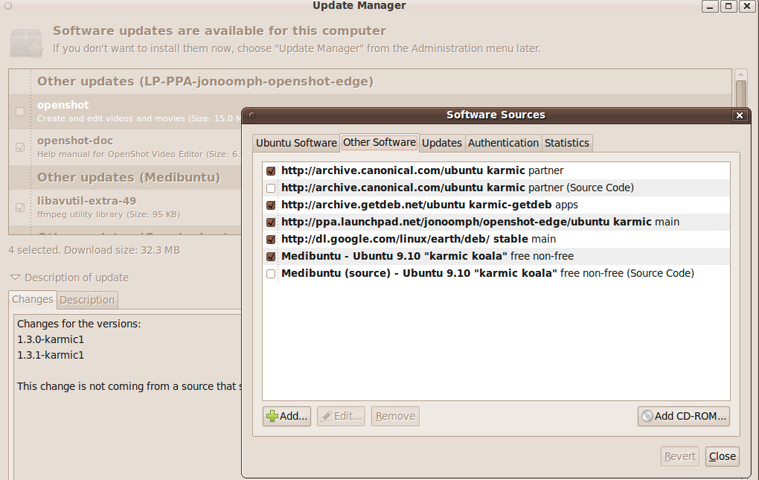 2011 Jun Update: I may go to a Linux Mint distro in the future --- or a different Ubuntu 'variant'. In any case, I still MAY want to be able to automate the process of creating a 'customized' Linux install --- either via 'customized' Linux on a USB flash drive or via an apps-install script, used after a 'base' install. I MAY devise an 'apt-get' shell script, someday --- to have a method of quickly installing the 'missing' apps after a new Linux install. Here is an example of such a script --- a pretty elaborate one --- with lots of comments explaining the script --- even giving a detailed overview in comments at the bottom. File is not shown. Technical difficulties. To find other such app-install automation scripts, you can do a Google search on terms like apt-get install script. Since I am not installing 'distros' on tens or hundreds of computers per month, I am finding that it may be best to use a package manager like Synaptic (for Debian-based Linux distros) to pick packages to install. This way, the packages can be chosen to meet the needs of the particular computer. Synaptic has some good search and filter capabilities that can help in finding suitable packages and utilities to install. In addition, the packages are installed in such a way to be compatible with various libraries of utilities. The Ubuntu 'Update Manager' does a really commendable job of keeping software up to date (for the 18 month life of a typical Ubuntu release). Here is an image that shows the archive sites (besides the main Ubuntu site) from which it drew updates for my Ubuntu 9.10 installation --- in the 2009 October to 2011 April time frame. 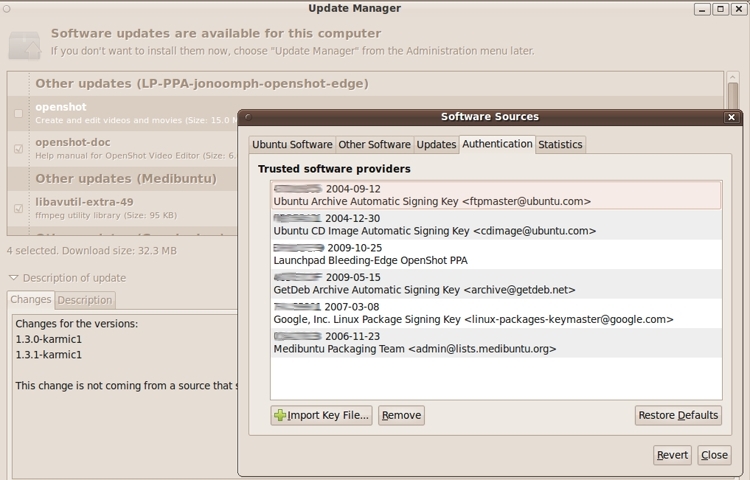 The Ubuntu Update Manager 'Authentication' panel gives this view of the 'trusted software providers'. Then you are more likely to have software that is 'in sync' with the libraries of compiled utilities on your computer. link to a Wikipedia page (if any) for the app. For an older Linux/Ubuntu release such as 9.10 Karmic, if I want to install a new release of a software package (and if I get some 'dependency' error messages about libraries needed), I may have to go to an older archive, like a Debian 'squeeze' archive, to get a package that is compatible with the libraries on my machine. Alternatively, I may have to write a 'wrapper' script for the main executable of an application and use some trickery with the LD_LIBRARY_PATH variable --- along with an install of a library (or libraries) in a directory in my home directory, rather than in a system directory such as /lib or /usr/lib. I have put together pages that describe how to install apps on an 'old distro'. See this Linux App Installs page and this Debian App Installs page. The latter describes how to use the Debian software archive site at 'snapshot.debian.org'. My thanks to Ubuntu and Mark Shuttleworth and Canonical Inc. --- even though I do not like their current direction (in 2011) to their 'Unity' desktop instead of Gnome2-Nautilus --- for showing how to make software installs and maintenance so easy in the Linux world. Other 'distros' are now doing the same. Since Ubuntu developers clearly based their 'software center' work on the Synaptic Package Manager, I want to thank the developers of the Synaptic Package Manager also. LinuxMint developers have added software ratings to their 'software center'. It remains to be seen how useful that is. It seems, almost invariably, that I am looking for something different in an app --- something different from what most of the reviewers value. For example, in a web browser, I value a well-developed, feature-full, and reliable Bookmarks Manager --- like that in Seamonkey. But comparisons of web browsers almost never mention their bookmarks managing capability. For another example, in a text editor, I value a well-tested, well-developed 'quick-swipe-and-paste' capability --- for copying sections of text from one part of a text file to another. But comparisons of text editors on Linux almost never mention their 'quick-copy' capability --- and hence they certainly do not pay attention to appropriate behavior of the current cursor position after such copy-and-paste operations. Similarly, my choices of Thunderbird for email and Filezilla for FTP do not often rank highest in comparisons of those types of apps. For this reason, I need my own apps lists --- above. Linux Apps Lists web page. Page was created 2009 Oct 26. Page was changed 2011 Jun 19. Page was changed 2018 Sep 02.